The political changes brought about by the English Civil War put an end to the new-found prosperity and confidence of the Comberford family. The career of Colonel William Comberford [see Comberford 5: Recusants, royal guests and civil war], the siege of Lichfield and the capture of Stafford and Tamworth by the Parliamentarians, and the course of events that followed eventually saw Comberford Hall pass out of the hands of the Comberford family, despite William’s best efforts to secure the family ownership of the Comberford patrimony. William Comberford’s kinsman, Francis Comberford, a parliamentarian magistrate [see Comberford 7: The Quaker Comberfords of Bradley, Staffordshire], was living at Comberford Hall in 1655, when he joined the Society of Friends (Quakers) after Edward Burrough and Francis Howgill visited Comberford Hall that year. However, Francis Comberford failed to recover Comberford Hall from Robert Comberford when Robert succeeded to the interests of his brother William, including Comberford Hall. ROBERT COMBERFORD (ca 1594-1671), who has been described as the last of this ancient family in England, is described incorrectly by Shaw, Adams and Stone as the son of Colonel William Comberford and by Stone as William Comberford’s nephew. However, in the pedigree Robert certified at Lichfield in 1663, he states clearly that he is William’s next brother and the second son of Humphrey Comberford. [See Comberford 5: Recusants, royal guests and civil war] In addition, Robert’s age in 1663 and at his death in 1671 confirm that his date of birth was 1594, making it impossible for him to be William’s son. Robert was born ca 1594. Following the death of his brother William Comberford in 1656, he recovered the Wigginton and Comberford estates from John Birch, the last remaining trustee, and his kinsman Francis Comberford, paying off all the debts or mortgages taken on by his William Comberford. By 1657, Robert Comberford and his wife were living at Comberford Hall, when they headed the list of 17 recusants reported as living in Comberford, although they were not molested in any way. 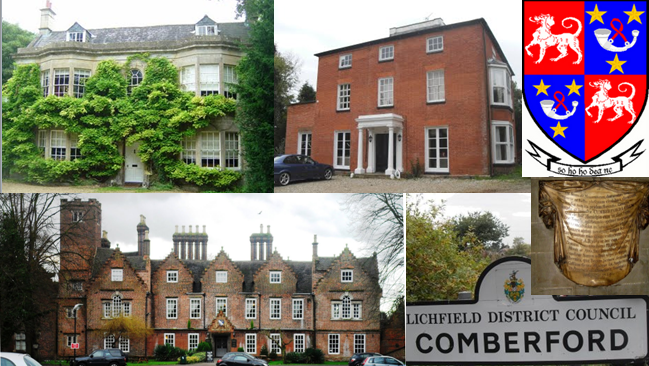 However, Robert Comberford does not appear to have recovered either the Wednesbury estates that once belonged to the Comberford family and he appears to have been forced to sell the Moat House in Tamworth. Between 1657 and 1663, the Manor of Wednesbury was sold to the Shelton family, of whom John Shelton of West Bromwich was a strict Presbyterian. By then, the Moat House in Tamworth had been sold for £160 to Thomas Fox, a former Parliamentary captain and later MP for Tamworth who was one of the bitterest enemies of the Comberford family. Stone says the Moat House was sold by Robert Comberford in 1654, although it is more likely that it was sold by Robert in an effort to clear his debts after William’s death. Nevertheless, Robert Comberford managed to redeem the sixty-year lease of Comberford Hall made in 1654 by his brother William Comberford to their Quaker kinsman Francis Comberford, and he recovered the other part of the estates leased by William Comberford from the last surviving trustee, John Birch. In 1663, Robert was 69 and living at Comberford Hall. In Lichfield early that year, on 30 March 1663, he certified the pedigree for the Comberford family of Comberford on the first day of the Visitation of Staffordshire carried out by the antiquarian and the Norroy King of Arms, Sir William Dugdale (1605-1686). Dugdale, who later became Garter Principal King of Arms, had received his MA at Oxford with Robert Comberford’s brother, William Comberford, in November 1642, had been commissioned in 1641 to make a copy of all the monuments in man English cathedrals and churches, including Lichfield Cathedral and Saint Editha’s Church, Tamworth. At the visitation in Lichfield in March 1663, Dugdale was assisted by two heralds who were born in Lichfield and educated at Lichfield Grammar School – his clerk, Gregory King (1648-1712), who later became Lancaster Herald and a pioneering statistician, and Dugdale’s son-in-law, Elias Ashmole (1617-1692), who held the office of Windsor Herald and was to become Lichfield’s most noted antiquarian. Ashmole was born in Breadmarket Street, Lichfield, and like Dugdale was, undoubtedly, familiar with the career of Robert’s brother, William Comberford. During the English Civil War, Ashmole was appointed the King’s Commissioner of Excise at Lichfield in 1644. Soon afterwards, he was given a military post at Oxford, where he devoted most of his time to study and at Brasenose College, although he did not formally enroll as a student. In late 1645, he left Oxford to accept the position of Commissioner of Excise at Worcester. Ashmole was given the additional military posts of Captain of the Horse and Comptroller of Ordnance, though he seems never to have taken part in any fighting. Robert Comberford furnished Ashmole with many of the details of the Comberford or Cumberford (the spellings are used interchangeably even in one manuscript) family, although Grazebrooke is insightful when he asks why Robert failed to furnish a number of pertinent particulars, including the full name of his father-in-law. In addition, it might be asked why he failed to provide dates of death for his brothers and sisters, or particulars of their marriages and children, some of which ought to have been known to Ashmole and perhaps to Dugdale too. Robert Comberford and his brother John Comberford leased the Manor of Comberford and Wigginton with appurtenances in Staffordshire to John Birch, William Bromwich and John Hopkins on 23 March 1664 for 20 years. The lease may have been a form of mortgage or a trust for the benefit of Catherine Comberford and the two daughters of Catherine and Robert Comberford, Mary and Ann, for despite this lease Robert and his family continued to live at Comberford Hall. 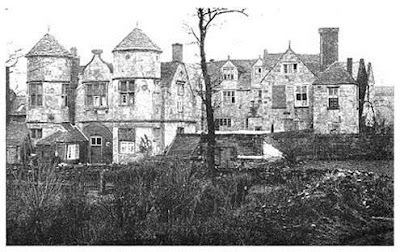 In 1666, he was assessed for 15 hearths at Comberford Hall and two hearths at Comberford Mill. He also had one small property with one hearth in Tamworth, where Thomas Hankes was his tenant. Francis Crathorne, a Benedictine monk from a prominent Yorkshire Catholic family, was living at Comberford as a missionary in 1667. Robert Comberford made his will in 1668-1670. He died in 1671 at the age of 77, and was buried in the Comberford family vault in Saint Katherine’s or the Comberford Chapel in Saint Editha’s Church, Tamworth. Robert must have been in his late 50s or early 60s when he married Catherine Bates of Sutton, Derbyshire, and she appears to have been at least 30 years younger than him. 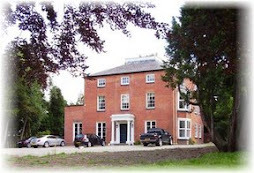 The Bates family was a Catholic family and in the late 17th century they moved to Pipe Hall, outside Lichfield, the former home of the Heveningham family [see Comberford 4: Comberford wealth from Wednesbury]. Catherine was still living in 1683, when she filed a renunciation in Lichfield of any interest in the estate of her daughter, Mary Giffard, who had just died. In 1705, when the Privy Council ordered a return by the parish clergy of papists and reputed papists “with their respective qualities, estates and places of abode,” 55 were counted in Tamworth and its neighbourhood, including Mrs Comberford of Comberford, her three grandchildren (Comberford Brooke, Catherine Brooke, and Mary Grosvenor) and her three servants. 1718. With the death of Robert Comberford in 1671, the senior male line of the Comberford family had died out, although a junior branch was living in Shropshire, and Robert’s descendants – as we shall see – continued through female lines in prominent Midlands families, including the Brookes, Giffard, Grosvenor, Mostyn, Parry, Slaughter and Smitheman families, and their descendants, many of them prominent Catholics. Shaw, Palmer and James Comerford said that above this plaque there was a representation of the Comberford coat-of-arms (gules, a talbot passant argent) impaling those of Bates of Sutton (sable, a fess between three hands erect argent), with the Comberford crest of a ducal coronet and peacock’s head, but this has long since disappeared. 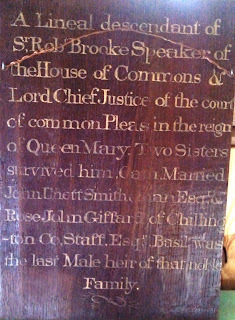 The plaque is surprisingly open in its Jacobite sentiments, only a decade after the Vicar of Tamworth was convicted for his Jacobite loyalties. The monument was probably erected in 1725 by Captain Joseph Comerford of Dublin who, in the previous year, had registered a pedigree in Dublin claiming descent from the Comberfords of Comberford for the Comerfords of Kilkenny. Comerford had bought the Anglure estate in Champagne, along with the title of Marquis d’Anglure, and he used the quartered Comberford and Parles arms as his own, placing them on a Comerford monument in Callan, Co Kilkenny. It is difficult to imagine how – if Robert Comberford was the last of the line and died in 1671 during the reign of Charles II – a branch of the family could later follow James II to Ireland and then into exile into France. The tablet in the Comberford chapel contains a number of other inaccuracies: at the time of Robert’s death in 1671, the Comberford family had been living in Staffordshire for no more than six rather than seven centuries; Robert’s death did not bring about the extinction of the Comberford line in England; the Comberfords of Comberford were not related to Joseph Comerford of Anglure or to the Comerfords of Ireland, who were descended from the Comerfords of Co Kilkenny, and through them from the Quemerford family who originated in Quemerford in Wiltshire; and Mary Giffard and Anne Brooke are more likely to have been buried with their husbands than with their parents in Tamworth. Nor did the Comberford family die out with the death of Robert Comberford. When he died, Robert had no sons, but while the Comberford name was continued in the Brooke family through his grandson, Comberford Brooke, the male representation of the Comberford line passed to his distant cousin, Francis Comberford of Bradley, who sued unsuccessfully for the estate. Comberford Hall continued to be lived in by Robert Comberford’s widow, Catherine, their daughter, Anne Brooke, her son, Comberford Brooke, and his children, perhaps as tenants of the Skeffington family, until at least 1718. Undoubtedly, the family was crippled by debts and mortgages, and Comberford Hall eventually passed to Robert Comberford’s cousin and neighbour, Sir John Skeffington, Viscount Masserene and Baron of Loughneagh, a royalist who had actively supported the restoration of Charles II [see Comberford 8: Comberford Hall]. MARY (COMBERFORD) GIFFARD (ca 1654/1655-ca 1683) was the elder daughter of Robert and Catherine Comberford. She was born ca 1654/1655, and was aged eight when Robert Comberford recorded the Comberford family genealogy at the Visitation of Staffordshire in Lichfield in March 1663. She married ca 1680 Thomas Giffard (ca 1655-post 1680), of The Lodge, High Offley Park, Staffordshire (born ca 1655, aged 25 in 1680). He was the son of Edward Giffard (ca 1624- ) of High Offley and Goat Street, Wolverhampton, and grandson of Peter Giffard (ca 1581-1663) of Chillington in Brewood. 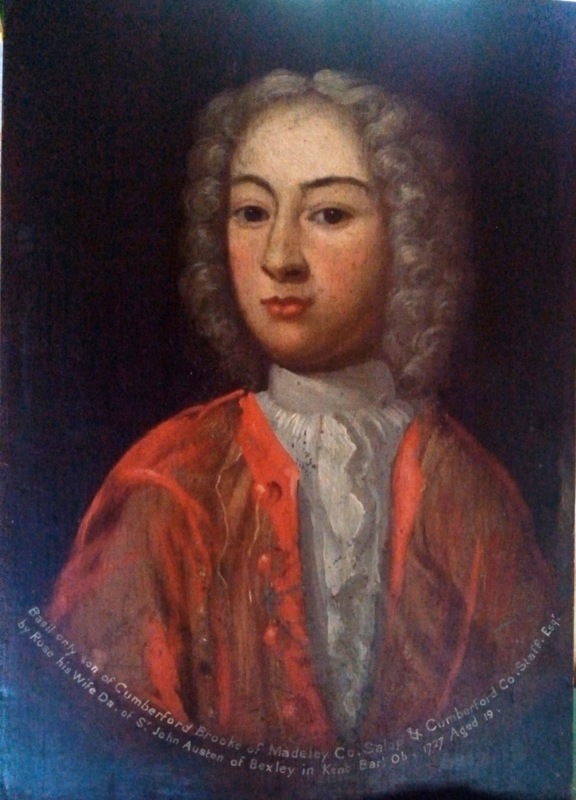 Robert was aged 25 in 1680. ANNE (COMBERFORD) BROOKE (ca 1655/1656-ca 1705? ), was the younger daughter of Robert and Catherine Comberford. She was born ca 1655/1656, and was aged seven in 1663. She married Thomas Brooke of Wolverhampton and Comberford on 14 April 1675, when both were described as “Papists.” At Lichfield in 1683, Anne Brooke, the wife of Thomas Brooke of Comberford, was granted the administration of the personal estate of Mary Giffard of Comberford. 1, Comberford Brooke or “Mr Brooke of Cumberford,” alias Captain Cumberford (ca 1675-1711), of Madeley, Shropshire, of whom next. COMBERFORD BROOKE, or “Mr Brooke of Cumberford,” alias Captain Cumberford (ca 1675-1711), of Madeley, Shropshire, and Comberford Hall, Staffordshire. He was living with his sisters and his grandmother, Catherine Comberford, at Comberford in 1705. He became an English Jacobite and a captain in the German Regiment of Saar. He maintained regular contact with his family and friends. As Comberford Brooke of Comberford he made his will in 1711. ●●● 2c, John Thomas Smitheman Edwardes (1802-1851). He was born on 28 July 1802 and inherited the estate in Little Wenlock, Shropshire, when his grandfather, John Smitheman, died in 1809. He sold that estate with 152 acres to Lord Forester in 1825. He died on 31 October 1851, and with his death this line of the descendants of the Comberfords of Comberford came to an end. ● 1a, (Sir) Edward Mostyn, 7th Baronet (1785-1841), of Talacre, Flintshire, who married his cousin, Constantia Slaughter (see above), and had a large number of children. This direct line of descent from the senior branch of the Comberford family of Comberford is probably represented today among the descendants of the Slaughter and Mostyn families. Meanwhile, the Bradley branch of the Comberford family continued to live in Shropshire after Francis Comberford’s failed efforts to recover from Robert Comberford the family estates he had once leased from William Comberford, including Comberford Hall [see Comberford 7: The Quaker Comberfords of Bradley, Staffordshire]. Penney, pp 229-230, 270; Journal FHS 5/3, July 1908, p. 165. Shaw 1, p. 434; Adams, p. 8; Stone, p. 60. ‘Visitations of Staffordshire,’ SHC 5/2 (1884), p. 92; Visit Staffs, p. 55, where he is named as the first son. See the will of Robert Comberford, National Archives, Probate 11/332, ff 440-442. Adams, p. 12; Stone, p. 60. See the will of Robert Comberford, National Archives, Probate 11/332, f. 440. See the will of Robert Comberford, National Archives, Probate 11/332, f. 441. SHC 2/2 (1881), p. 35; SHC 5/2 (1884), ‘The Visitations of Staffordshire,’ pp viii, 91-92. See Chris Upton, A History of Lichfield, pp 71-74. H.S. Grazebrooke, ‘Preface,’ SHC 5/2 (1884), p. xii. See the will of Robert Comberford, National Archives, Probate 11/332, f. 440; Staffordshire Record Office, Mss Records of the Congreve family of Congreve and Stretton, parish of Penkridge, Family Settlements, Birch Family Settlements, Trusteeships Etc., D 1057/E/3/3. National Archives, Probate 11/332, ff 440-442; registered copy of will and inventory, Comberford memorial papers, D 5368/3/10/1-7. Comberford memorial in Saint Editha’s Church, Tamworth, transcribed and photographed by Patrick Comerford, 22.3.2007, 26.2.2011, Shaw 1, p. 420; Adams, pp 8, 14. ‘Visitation of Staffordshire,’ SHC 5/2 (1884), p. 92; Visit Staffs, p. 55; Shaw 1, pp 428, 434; Comberford memorial, transcribed and photographed by Patrick Comerford, 22.3.2007, 26.2.2011; Adams, pp 13-14. However, Adams is mistaken when he gives Catherine’s name as Mary (Adams, p. 14). Greenslade, ‘The Popish of Lichfield,’ p. 131. NA Prob 11/565, 11/566; Knight and Son papers, D 4452/1/16/10/1. ‘Visitation of Staffordshire,’ SHC 5/2 (1884), p. 92; Visit Staffs, p. 55. Notes added to the ‘Visitation of Staffordshire in 1663-1664,’ SHC 5/2 (1884), p. 92, where his first name is not given; Visit Staffs, p. 55; Shaw 1, p. 434; Adams, p. 8. ‘Visitation of Staffordshire,’ SHC 5/2 (1884), p. 92; Visit Staffs, p. 55; Shaw 1, p. 434; Adams, p. 8. Note added to ‘Visitation of Staffordshire,’ SHC 5/2 (1884), p. 92; see Visit Staffs, p. 55. Comberford memorial, transcribed and photographed by Patrick Comerford, 22.3.2007. See Shaw 1, p. 428, Palmer, p. 290 and James Comerford (1902), pp 1-2, where it is transcribed with errors; Adams, pp 13-14; and Stone, p. 60, plate 67. Shaw 1, p. 428; Palmer, p. 290; James Comerford (1902), p. 2. Notes added to the ‘Visitation of Staffordshire in 1663-1664,’ SHC 5/2 (1884), p. 92, where his first name is not given; Visit Staffs, p. 55; Shaw 1, p. 434; Adams, p. 8; ‘Giffard,’ http://genforum.genealogy.com/giffard/messages/1.html (25.08.2007). Greenslade, Catholic Staffordshire, pp 179, 184; Upton, p. 49. National Archives, Probate 11/566; Knight and Son papers, D 4452/1/16/10/1. ‘Austen 2,’ http://www.stirnet.com/HTML/genie/british/aa/austen02.htm (19.6.2007); John Burke and Bernard Burke, A Genealogical and Heraldic History of the Extinct and Dormant Baronetcies (London: J.R. Smith, 1884), p. 29. Knight and Son Papers, Stoke and Staffs, D 4452/1/16/10/4. Calendar of Stuart Papers, vol 4 (London: HMSO, 1910), pp 308, 537, 538; vol 4 (1912), p. 160; Miscellanea, Catholic Record Society (Great Britain), vol 13, p. 9. Shropshire Archives, Madeley Manor Papers, 1681/132/21; John Burke and Bernard Burke, A Genealogical and Heraldic History of the Extinct and Dormant Baronetcies (London: J.R. Smith, 1884), p. 29; ‘Austen 2,’ http://www.stirnet.com/HTML/genie/british/aa/austen02.htm (19.6.2007); Miscellanea, Catholic Record Society (Great Britain), vol 13, p. 9. Shropshire Archives, Madeley Manor Papers, 1681/132/21; Lincolnshire Archives, Hawley family papers, Quitclaim 2 Hawley/1/G/44. Lincolnshire Archives, Hawley family papers, Quitclaim 2 Hawley/1/G/44; Miscellanea, Catholic Record Society (Great Britain), vol 13, p. 9. Burke’s Landed Gentry (1937), p. 297 (s.v. Burton of Longner Hall). ‘Little Wenlock: Manor and other estates,’ A History of the County of Shropshire: vol 11: Telford (1985), pp 80-81, http://www.british-history.ac.uk/report.asp?compid=18078 (25.6.2007). VCH Salop, vol 11 (1985), pp 35-40; Burke’s Landed Gentry (1937), p. 881 (s.v. Giffard of Chillington). Burke’s Landed Gentry (1937), p. 881 (s.v. Giffard of Chillington). Oxford Dictionary of National Biography, vol 5 (Oxford: Oxford University Press, 2004), p. 392; Burke’s Peerage, various eds, s.v. Berkeley; ‘Berkeley 06,’ http://www.stirnet.com/HTML/genie/british/bb4ae/berkeley06.htm (26.6.2007). VCH Salop, vol 11 (1985), pp 35-40. 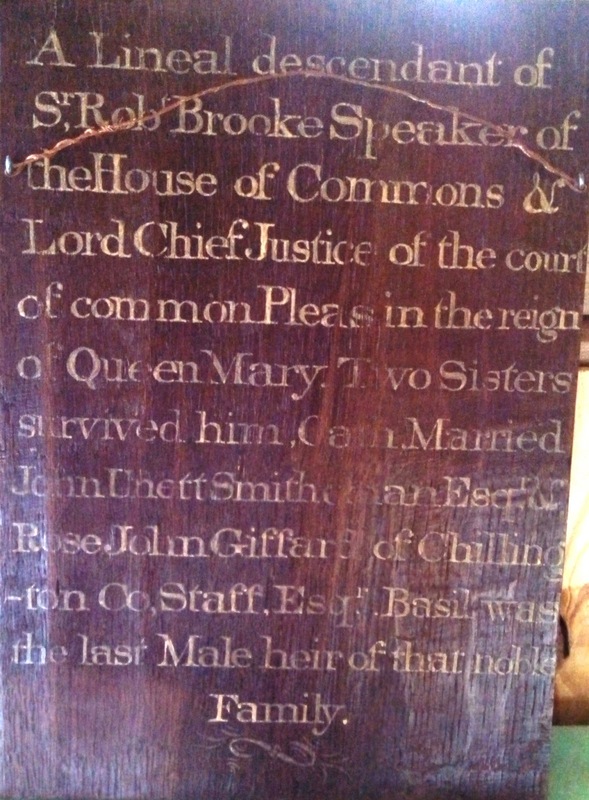 The information on the Slaughter family is from Burke’s Peerage and Debrett’s Peerage, various eds, s.v. Mostyn (1670) of Talacre, Flintshire, and ‘The Slaughter Family of Upper Slaughter, Gloucestershire,’ http://www.geocities.com/sjkelsey2000/slaughter/index.htm#TOC (25.6.2007). ‘The Slaughter Family of Upper Slaughter, Gloucestershire,’ http://www.geocities.com/sjkelsey2000/slaughter/pafg26.htm#70661 (13.7.2007). © Patrick Comerford, 2007, 2008, 2009, 2010, 2011, 2012, 2013, 2015, 2016. Last updated: 27 June 2008; 15 and 17 August 2009; 16 July 2010, 4 October 2010, 10 November 2010, 24 December 2010; 3 March 2011, 26 May 2011, 3 June 2011; 30 May 2012; 19 May 2013; 16 June 2015; 27 April 2016.